When I was a sprout, August was the do-nothing tail end of summer. We were right on the cusp of Labor Day’s last fling and the dreaded return to school. Actually, Unk was usually ready to go back by August. By then, me and my buddies had pretty much exhausted the potentialities of summer. Playing outside was like sitting in a sauna. 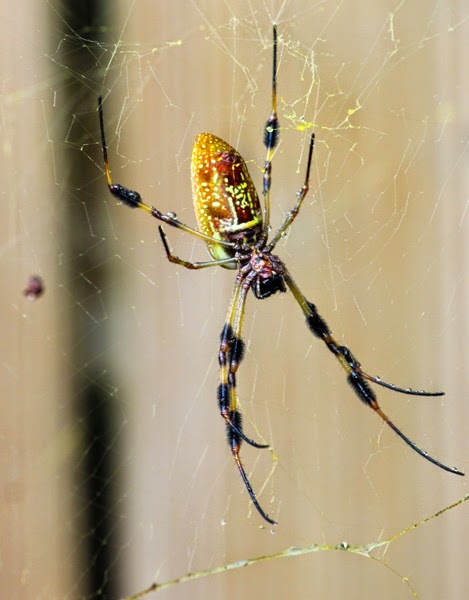 Then as now, only the Summer Spiders, the Golden Orb Weavers, seemed to enjoy the hot and heavy, waning days. Not only was it awful hot and humid, even for us Gulf Coast denizens, nasty thunderstorms had begun to roll through, making the lifeguard’s “Out of the pool!” order so frequent we didn't much bother with the Swim Club anymore. The beach? Nothing but jellyfish and seaweed most days. Me and Jitter and Wayne Lee would sit inert in the steam bath of somebody’s carport languidly asking each other, “What do you want to do?” and receiving the unvarying reply, “I dunno. What do YOU want to do?” The hot August nights? I probably wouldn’t have seen a thing other the undersides of clouds with my Tasco 3-inch Newtonian since mid-July. So, it’s sorta ironic this August was such a busy and productive month for your old Uncle astro-wise. Foremost on my agenda was preparing for the start of yet another year at the university teaching my astronomy labs (I never teach in the summer). They’re back—confused looking students wandering the halls of the physics and math building, imploring ol’ Unk to tell them where they are supposed to be. You know what? Curmudgeon though I may be, I missed ‘em. There was also (star) partying to do. As you read last time, I spent a couple of days enjoying the guilty pleasure of West Virginia nights where the temperatures never got out of the 60s. 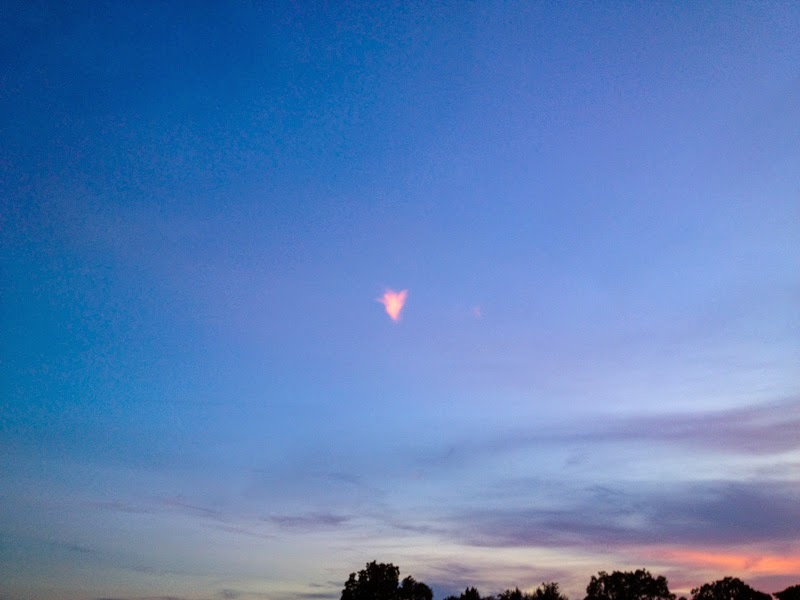 I didn't see pea-turkey in the sky, as you know, but I had lots of fun with lots of friendly fellow amateurs and that dern sure was good enough. I did get some August nights under the stars, but in less comfortable conditions. Upon our return from Chiefland, I spent successive full Moon nights doing prime focus deep sky imaging for a Sky & Telescope piece I had to get out. What was surprising about that? I was amazed how much a DSLR at ISO 3200 will bring back from the humid, moonlit, light polluted sky of my backyard. Hell, I could expose for as long as 10-minutes and get OK pictures. The background was noisy as all get out from light pollution and heat, but even fifteen years ago I’d have been gobsmacked to get deep sky images as good from a bright backyard. While my DSLRing went right well, there was no doubt in Unk’s formerly military mind that I was ready to take a break from guide cameras, GEM mounts, and USB cables. In the last lazy days of summer with fall’s (slightly) cooler temps just ahead, my fancy had turned back to visual observing. Oh, I will also get back to Destination Moon and do some Moon pictures as Luna fattens up again, but I’ve decided it is time to break out the old eyepiece case. Dusted off the aluminum eyepiece box I got from cotton-picking Orion who knows how many Moons ago, popped her open, and had a look at my motley crew of oculars. I have never been a collector. I buy eyepieces that suit my needs even if they are from various makers and various product lines of those makers. I have no interest in lining up EVERY Nagler so I can gloat over ‘em like Scrooge McDuck in his freaking money bin. What’s in Unk’s eyepiece case? The numero uno spot, you will not be surprised to hear, is held by my two Ethos 100-degree wonders, the 13mm and the 8mm. I consider the 13 Ethos the best all-round eyepiece in the world. The 8mm ain’t far behind it, either. So how come Unk don’t have more Ethoses? I don’t have the shorter ones because I mainly use my eyepieces in SCTs, and don’t need to go shorter than 8mm very often. If I need more power, I just switch the Barlow into the light path with my Denkmeier Power Switch diagonal. The 12-inch f/5 Dobsonian, Old Betsy? I slide the 8mm Ethos into the (excellent) TeleVue Big Barlow I have had for years and years. “How about longer than 13mm, Unk?” I haven’t bought a 21mm Ethos because it vignettes in the SCTs with an f/6.3 or f/7 reducer in place. So does the 20mm 100-degree job from Explore Scientific. At f/6.3, the 13mm Ethos will give me a magnification similar to that of the 21mm Ethos at f/10, anyway. I have been tempted to get a 100-degree just for Old Betsy, but if I did, it would be the Explore Scientific 20mm. In tests I did when that eyepiece first came out, I determined it to be nearly the equal of the Ethos with a price tag that makes buying it to use in just one scope far more palatable. Wut else? Actually, campers, I do have a longer than 13mm 100-degree AFOV hunk o’ glass, but it ain’t a TV or ES. I am talking about my 16mm Zhumell, the Happy Hand Grenade. It does astoundingly well in the SCTs, and while it don’t come close to the performance of the more expensive spread in f/4.8 Betsy, it is more than usable. I love it. Can I be honest with y’all? Them dadgummed 100-degree eyepieces have spoiled me for narrower AFOV oculars, even though I’ve got some nice ones. Like the 28, 16, and 7mm Uwans. These 82-degree field eyepieces were amazing when they were first released, purty much duplicating Nagler performance for less money. They are still very good eyepieces. I even use them on occasion. What’s not in my case anymore is my much-loved 12mm Nagler. It was my favorite eyepiece from 1995 till I got my hands on the 13 Ethos six years ago (can it possibly have been that long?). I knew I would never use the 12mm Type II again, and sold it to a good buddy in the Philippines, who has given it a good home. I do still have three TVs; however, three Panoptics, the 35mm, the 27mm, and the 22mm. While their 68-degree fields ain’t spaceship porthole sized, they are all beautiful performers and throw up lovely images. They seem very well suited to my SCTs, especially the 35mm, which was the first “beer can” (sized) eyepiece I ever owned. All Unk’s glass was in good shape, so I closed the lid of that old eyepiece case (really one of the ubiquitous “tool attaches” you could buy at home improvement stores in the 1990s, just with an Orion sticker and a higher price). Looking at eyepieces was fine. Looking through them would be better. What were the prospects for that and for getting Project Scotty underway? So-so. Down here, weather can be so variable at the end of summer that you are wasting your time putting much credence in the Clear Sky Clock, Scope Nights, or even The Weather Channel and Wunderground. Saturday night would not be outstanding, that was sure. It might not be anything at all—my old pal Max called Saturday afternoon to let me know it was raining felines and canines in the north part of the county. It was not raining at Chaos Manor South (the NEW Chaos Manor South, natch) at 6:00 in the p.m., however, and even seemed to be clearing a mite. The sky had never been completely overcast, though there’d been stretches in the afternoon when it almost was. I decided my best bet was to stick to my maxim: “If it ain’t raining, you head to the dark site,” and began loading the 4Runner, Miss Van Pelt. What could happen? That load-out began with Old Betsy, of course. Followed by the box ‘o eyepieces. Next was Dorothy’s pretty, wooden eyepiece case, which holds the TV Big Barlow (no room at the inn in the main case) and also the Sky Commander DSC computer, the declination arm and encoder for it, and the computer interface cable Unk put together a few weeks back. Brought the laptop, the Toshiba Satellite, along to run SkyTools, of course. The PC has a 17-inch display and its internal battery don’t last long, so I packed a little inverter from Harbor Freight and a jump start battery as well. 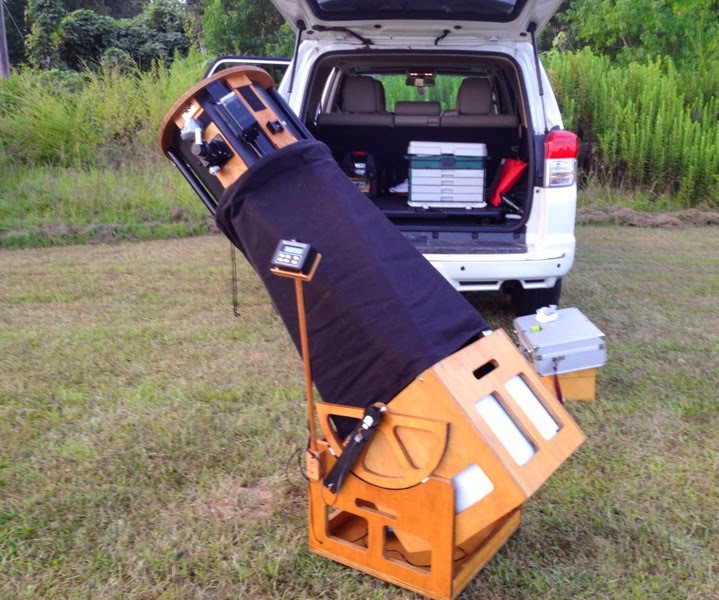 At 6:30 we was ready to roll, and roll we did, west to the quiet airstrip the Possum Swamp Astronomical Society uses for our deep sky observing. Didn't really know if there’d be any of my fellow PSASers on-site or not. The sky didn't look too bad, but it looked bad enough to keep reasonable-minded folks at home. I suspected my only “company” might be the Skunk Ape, the Mothman, and the Little Grey Dudes from Zeta Reticuli II. So, I was both surprised and pleased to find one of my compadres already on the field and set up. What he’d set up was his nearly new Orion XT10g 10-inch. I was skeptical about Orion’s Synta-made goto dobs when they first came out, but I have become a believer. Those I’ve used have featured good optics and good pointing accuracy. Hell, Max even does impressive deep sky imaging with his. This new tenner was to be no different. 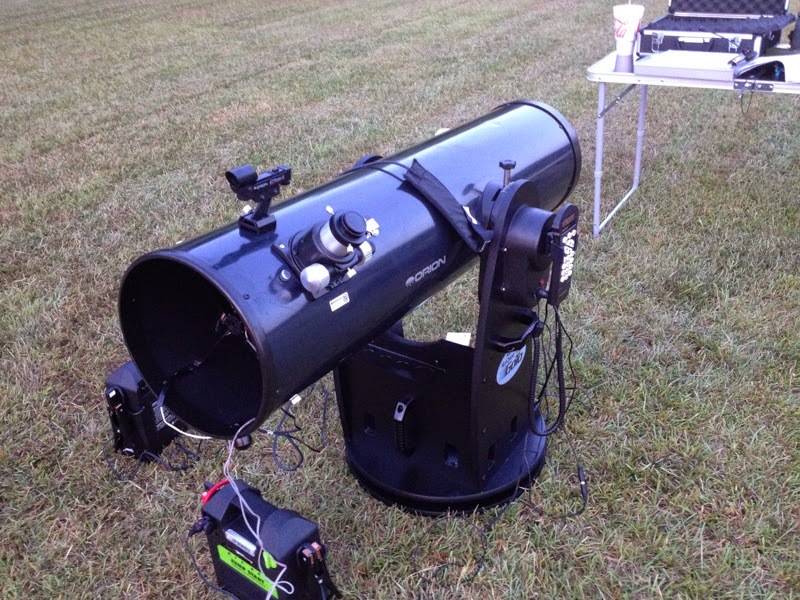 When I tried it late in the evening, I was impressed by the images in the eyepiece after its bang-on slews. I believe you could do a lot worse than an XTg, particularly the 10-inch model. That was later. First order of business was to decide whether I was going to set up or not. At sunset, it was about 60% clouds. I waffled. While I was sitting on that pea-picking fence, a couple of new members arrived, and, shortly thereafter, my old observing companion, Taras, and his 15-inch Dobbie rolled onto the field. Five folks on a semi-punk night was good, I thought. I finally decided “What the hell” and began putting Bets together. That consists of plunking her rocker box down, dropping the mirror box into that, and bolting the upper cage and truss tubes to the mirror box. Don’t take long. When I am just going out to the local dark site, I leave the poles attached to the upper cage. In maybe ten minutes, I am ready to collimate. While Betsy holds her collimation well despite disassembly, like most truss scopes she does need a little tweaking every time. When folks see me collimating out on the field, they are sometimes surprised I don’t use a laser. In other words, they wonder why Unk is such a backwoods stick-in-the-mud Luddite of a hillbilly. Truth is, Unk is stingy. Not in the class of our aforementioned feathered friend Scrooge McDuck, but I don’t like to spend money when I don’t have to. A good laser, a laser that will itself be collimated and remain collimated, is right expensive as I gauge such things. So, which collimation tool do I use? One of the ubiquitous combo sight tubes/Cheshires many astro-merchants peddle. Mine came from Celestron, but Orion and others have ‘em too. Collimation with one is simple. Place in focuser via a 1.25-inch adapter if the focuser is a 2-inch like Betsy’s. If the crosshairs of the sight tube are not over the paper…uh… “donut” (this is a family friendly blog, y’all) on the primary, adjust the secondary mirror till they are. Then, just adjust the primary so the dot created by the Cheshire is inside the donut. The collimations I produce this way are fine and I do not yearn for that elusive More Better Gooder. Scope collimated, I set up the laptop and hooked the serial cable to the Sky Commander computer, which I’d already mounted on the little “podium” screwed to Betsy’s rocker box. I plugged in the altitude and azimuth encoders and was done. All that remained was to wait for alignment stars and (maybe) clearer skies. So I waited. And I waited. And I waited. I like to align the DSCs using Polaris and Spica this time of year. Alas, both were invisible, so I began hunting for another pair. It ain’t hard to align the Sky Commanders, but the stars need to be separated by a decent amount of azimuth and star two shouldn't be too high. Polaris finally winked on as conditions began to improve. Other than clouds to the west and one weird little puff hovering in the south, the sky was at least semi-clear—though there was considerable haze. Spica, far into the west now, never did show, so I went with Arcturus. It was a mite high, I thought, but my push-tos put every object I requested that night in the field of the 13 Ethos—and often the field of the 7mm Uwan, so I guess I did OK.
What did I not do OK? I didn't turn on the PC. I should have, but the skies were looking awful putrid at astronomical twilight, and I followed Taras lead and packed up the laptop. Alas, that came back to bite me in the posterior later, as you will hear. Scope aligned, I set to work, beginning with everybody’s fave northern globular cluster (if not necessarily the best northern glob in Unk’s opinion), M13. The Great Globular seemed like a propitious place to start, since Scotty first visits it in July of 1953, the month and year of Unk’s birth. 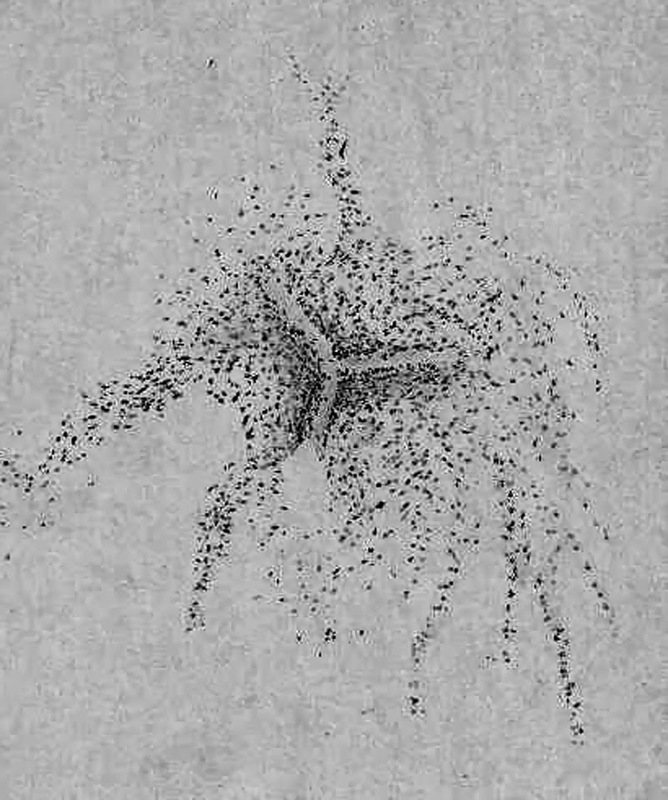 What Walter Scott Houston was mainly interested in on that long ago July was not the cluster itself, but one of its features, the legendary Propeller. As he tells us, observers beginning with Lord Rosse have reported a curious propeller-shaped pattern of three dark lanes. While Rosse’s drawing shows the Propeller seemingly centered on the cluster, it is really outside the bright core, on its southeast side. Mr. Houston doesn't challenge us to look for the Propeller; he never had to do that. Just mentioning something in the column was enough to send his fans after it. In vain this time. It took nearly thirty years for positive sighting reports to come in. The Propeller was glimpsed by John Bortle and Dennis di Cicco in 1980 and 1981, respectively. Dennis noted that while the feature was easy enough to see in Stellafane’s 12.5-inch Porter Turret Telescope at 180x, it was invisible in a nearby 12.5 at half that power. That is the secret. The Propeller is only readily visible at magnifications of around 200x. Aperture matters, too. 10-inches is probably the smallest scope that will allow most observers detect the thing, and it is much easier with 12-inches. As you might have guessed, steady seeing damned sure helps, too. Sounded like everything was coming up roses for Unk on this night. Betsy was a 12.5-inch scope, the 8mm Ethos yielded 188x, and the seeing was good in cloud free areas. Still, I’ve had a hard time finding the Propeller over the years, even when it’s been “easy” for other observers with the same telescope. Not this time. It was obvious in the Ethos, and maybe even a little more obvious with the 7mm Uwan (214x). Hell, I could see it well enough, three dark lanes of seemingly equal length, that I was able to help Taras, who’d never seen it, spot it in his 15-inch. What did I think of it in a telescope? It really is magnificent, especially in an 8mm eyepiece, which gives it a better image scale and makes it look more interesting after you’ve been staring at that crazy diamond, M13. Ground truth, though? It is a GOOD cluster, but it would not, as some people opine, be considered a GREAT one but for nearby M13. There are many other superior globs, far superior globs, this time of year: M5, M3, M15, M22. No denying M92 is a second stringer, but it is a nice second stringer. I turned Bets to M27 just as it was climbing nice and high and entering a good, clear patch. I found both “Dumbbell” and “Two Cones” inadequate to describe the nebula. At first, “the Apple Core Nebula” was better, but after a little staring with the 13 Ethos, it came to look less and less like a celestial fruit. Under good conditions, the empty area around the apple core begins to fill in in a right quick hurry. 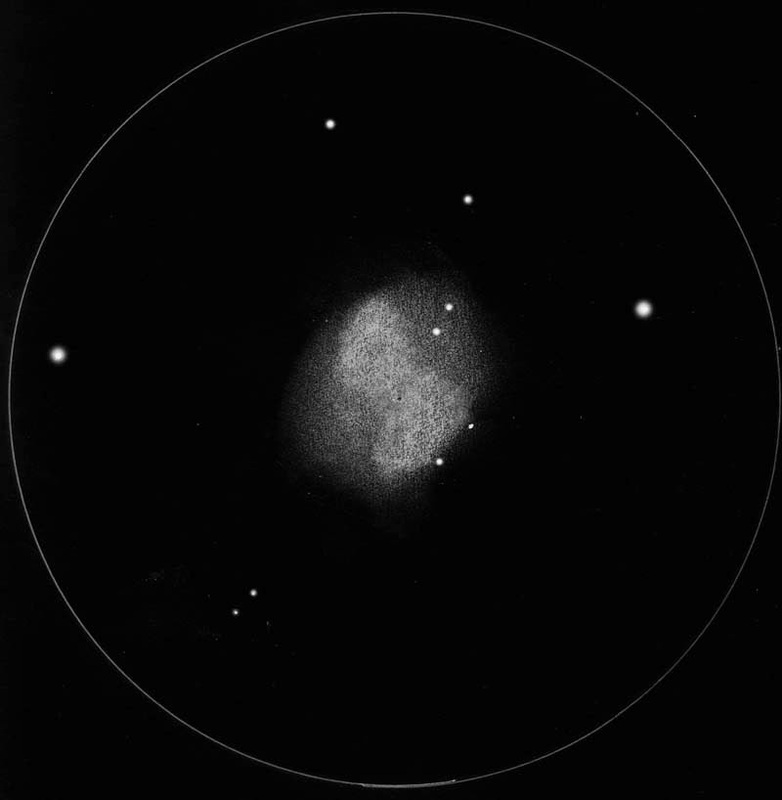 What M27 begins to look like is a football, an American football. I can even see this transformation with my ETX 125, Charity Hope Valentine, with a UHC filter in place, anyhow. I didn't put a filter on the Ethos on this night; I was after M27’s central star, which would have been dimmed by a UHC. I did switch to the 8mm Ethos for a little more magnification. I hadn’t hunted up the Football’s central star in quite a while, and though I knew I’d seen it, I didn't remember how difficult it was (it is easy with a camera). It popped right out in the Ethos. Why did Scotty rate it as difficult? Remember, he pronounced it hard with most amateur telescopes. Even well into the 80s, the most common amateur scope was probably a 6 or 8-inch. 12-inches helps as much with this star as it does with the Propeller. Seeing is also important, and I suspect my seeing is better than Scotty’s was, even in Kansas. Still, it seems strange he almost make’s M27’s central star sound harder than M57’s (below). After having imaged M3 a couple of weeks before, I was interested both to hear what Scotty has to say about its visual appearance, and to get a fresh visual look at it myself. Alas, like M92, all that’s in the Deep Sky Wonders book concerning M3 is that it is visible to the naked eye under the proper conditions, if not easily. So how was Messier 3 in Betsy on a late summer’s eve? One night at the 2004 Georgia Sky View I spent quite a while viewing Canes Venatici’s glob with my NexStar C11, Big Bertha. My log entry from that night reads, “In the 22mm Panoptic at 127x, M3 is as perfect as it ever gets. Outlying stars extend across the whole field. All the stars are exceedingly tiny, and [the cluster] is resolved to the core, which looks rather strange, almost triangular.” On this average Saturday night at the PSAS dark site, it was not quite that good, mainly because of the haze in the west and the globular’s increasingly low altitude. It was still a wonder, though; there is no way to make this one look bad. Not surprisingly, Scotty ranks the Ring Nebula among “The Great Planetaries of Summer,” and it is given considerable space in the book. What interested me most was Scotty’s take on the Ring’s notoriously elusive central star. While he says it should be visible in a 10 or 12-inch scope on “a top night,” and that he has seen it easily with the Porter telescope, he admits it is often invisible in a much larger telescope. That may be due to the star’s (suspected) variability. What makes it especially tough, however, is the fact that the Ring’s interior is not empty, but filled with obscuring haze. Unk? I have suspected the central star with Betsy at magnifications of 600x and above on nights of especially steady seeing. Just “suspected.” The only time I’ve really been convinced I’ve seen it was at the old Mid South Star Gaze on a dark and steady spring night using a 32-inch Tectron Dobsonian at powers of up to 900x. And it wasn’t easy even then, not hardly. Course, even nearly twenty years ago I didn't have perfect eyes—or Scotty’s skills. That doesn't mean the ring isn't wonderful. On this night, when the clouds stayed away, its shape was as nicely delineated as I’ve ever seen it. It was sharp edged, obviously elongated, and there was a “hump” of nebulosity on one end. The donut hole was hazy and pretty and I left it at that. With another batch of clouds incipient, I didn't grab my 3x apochromatic Barlow and give the central star ago. Some other night, y’all. 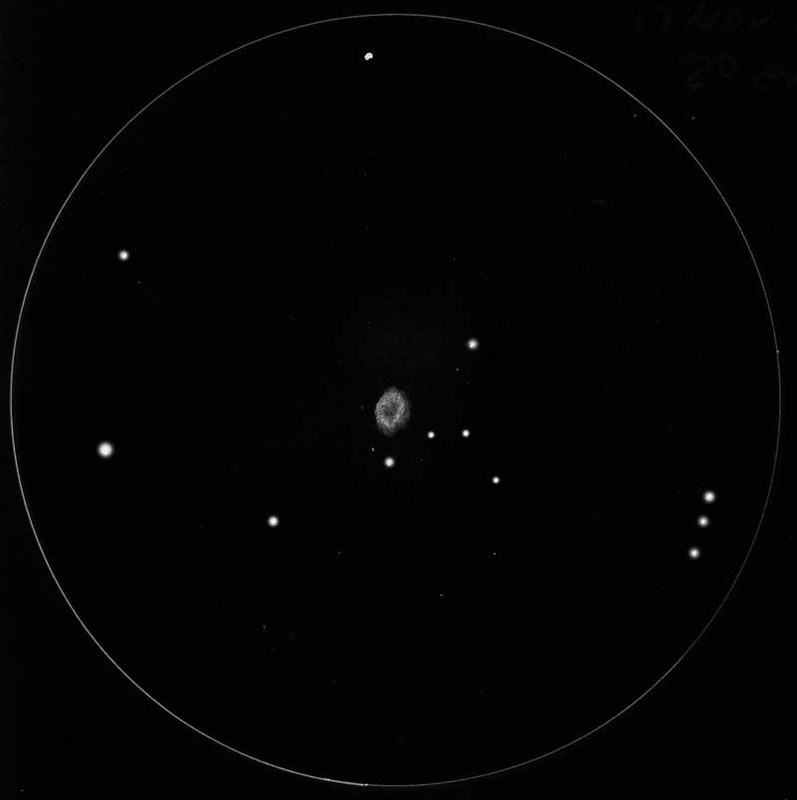 M57 admired, I bagged at least a dozen more DSOs. Unfortunately, they were not Scotty Objects. I didn't fire up the computer, and, so, did not have my list at hand. I just assumed M10 and M12, for example, would be on the list. Well, you know what they say about the word “assume,” doncha? Neither glob was on a Scotty. Nor were any of the other objects I pushed to after the first five. It is kinda ironic your old Uncle, who always preaches “have an observing list,” was semi-skunked for want of one. Oh, well. By midnight, an old Moon was on the rise, and we decided to pack it in. As always, one of the joys of using Old Betsy is the quick tear-down following my throwing of the accursed Big Switch. I had actually disassembled her somewhat before midnight, when the skies appeared to be headed south again, and had been enjoying the views in my mates’ scopes. Back at the New Manse, I fumed over a tumbler of Rebel Yell and a replay of the afternoon’s Braves game. Five objects was dang-sure not many. Howsomeever, I was lucky to have seen a thing on a below par evening, and maybe this is actually a good pace at which to proceed. Certainly not every Scotty will need the time and space of these showpieces, but many will. Let’s just take it easy and see how far we get in a year, muchachos. UNK...I can't believe that you have never "truly seen" the central star in M-57! Surely, even being notoriously difficult, it must have been observable at least ONE of the times we've been at Chiefland. Regardless of what Scotty (or anyone else) may say, I've never seen it in anything under 18" and ~600X (and that, only once). Even the 28" is often 'skunked'. This baby is the stellar equivalent of the Horsehead. The slightest haze...even high humidity...or trace of a breeze...forget it! Were that star sitting out all by its' lonesome, it would be easy in much smaller scopes...the nebulosity inside the Ring plays hell with contrast.